I’ve just completed my Change Agent training for Better World Books. What an incredible company! They are what’s called a B Corporation, which means many things, but essentially is capitalistic but meets far higher standards for giving back socially and environmentally. They are a book for book company. For every book sold, they donate a book to someone who otherwise might not have the opportunity to easily access books. No books go to landfills. They are sold, donated or recycled. The literacy initiative is so important to me as a former teacher, avid reader and writer with the goal of publication someday soon. I can’t imagine not having the world of words opened to me. It must be like living in a less bright place, though sadly much of the population is illiterate, many of them women and children. Placing books in the hands of those who have none and promoting programs that open doors to reading changes lives. 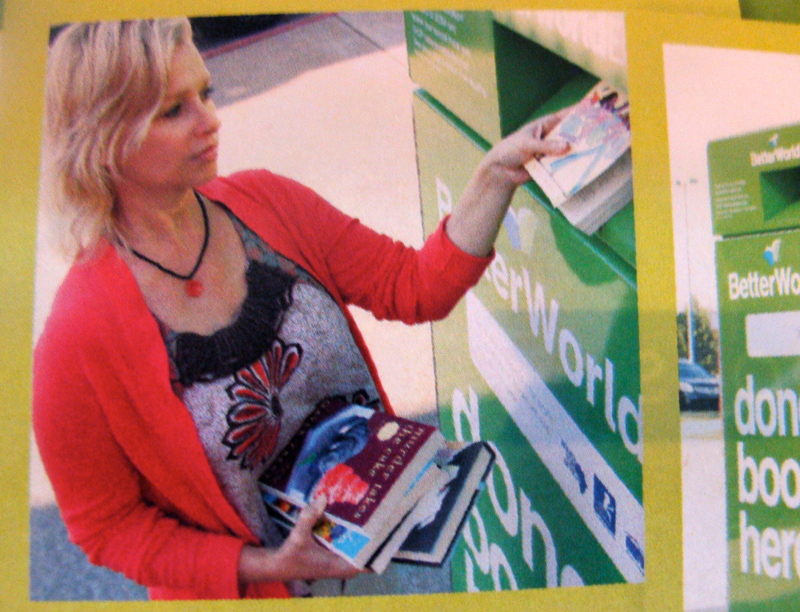 My goal as a change agent is to secure locations for Better World Books drop boxes. These boxes must be placed in highly visible locations in well-visited areas. They are maintained and monitored for fill levels. The host is paid a monthly residual for the books collected as well as the literacy partner chosen by the host. The host has the option of donating the entire amount to the literacy partner. Any local non-profit school, church, library, etc. is a viable literacy partner. In addition to the monetary benefit, the environmental gains of keeping books out of landfills is greater than most of us realize. Plus, the host exhibits an outward example of community support toward literacy and the environment by placing a drop box on his or her property. Typically a drop box will drive well-read, educated traffic to your place of business over and over, spreading by word-of-mouth. This is my sales pitch. Basically, I can’t see a down side to hosting a box based on the information. Better World Books is currently placing drop boxes in many metro areas. Contact me if you want a chance to change the world one parking space at a time! Sounds like a great cause, Susan! Best of luck to you!